—How To Grow Your Own Gourmet Lettuce from Seed—It's Easier than You Think! You can read the story of how the newest member of our farm dog team came to be with us here, and then see some of what he's been up to during the past five months here. © FarmgirlFare.com, where I harvested several gorgeous pounds of organic lettuce from the kitchen garden back on May 29th , just in time to save it from bolting and becoming bitter during this relentless heatwave. Despite enjoying large salads nearly every night, we still have some lettuce left in the fridge, partly because Bert—who is alive and well—has so far only choked down enjoyed one serving, which had to be very cleverly disguised (as in, mixed up with a bunch of meat and cheese and other good stuff). But he did eat it! Bert - what a sweet guy but definitely with a determined look in his eyes! And look at his hind legs. Maybe you could tease him with a different dressing each day (joking, I do not want to provoke any reaction)? My own dog, Chica, is a lovely 12 year old mixture of Labrador and Weimaraner, combining all the lovely traits of both races. I enjoy your pictures and posts of a rural living from a rather urban environment in Switzerland and look forward to it each day. Have a lovely summer and a plentiful harvest. My dog eats a lot of raw vegetables now. She didn't when younger though. She prefers salads ie lettuce and spinach with dressing though. I give her either a bit of olive oil and sometimes add some lemon juice. Tabbouleh salae is one of her faves! 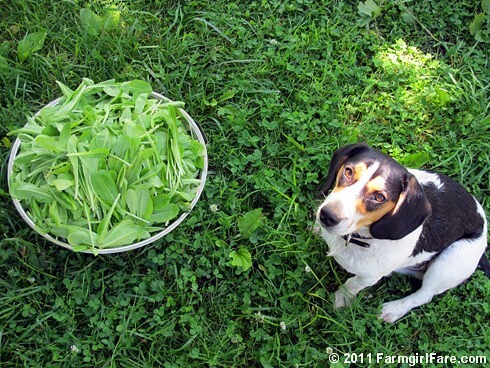 Greens, in limited amounts, are very good for dogs. That's why they eat grass on occasion. Love that Bert stretching his belly on the cool, green grass. :) This is true! Lettuce is one veg my dogs leave behind! I think you should call this, "Death by Spinach!" YOu always have the best pics! It's like eenie, meanie, miney, mo...trying to figure out what my older dog Country will eat every night. He is so cute. Looks like he'd really like to help you. But, he's a dog. Lucky....no work.